don't code today what you can't debug tomorrow: new laptop, free yourself! The other day, I couldn't resist buying the el-cheapo Athlon 1.6 GHz-powered Acer Aspire 5532 in BestBuy for $330. With its 15.6 inch screen, seems that it is quite a nice bargain. It comes (of course) with Windows 7 Home Premium, but after slapping openSUSE 11.2 DVD I got from the last Camp KDE (must be from Will, thanks dude!) and a bunch of keystrokes, a few hours later the machine happily runs the shiny KDE 4.4. Sound was not a problem, even WiFi was easy to get it working (hard to believe that after all these years, NetworkManager still does not work for me, maybe my bad karma). The included radeonhd driver is good enough for its Radeon HD 3200 (RS780M chipset), but for the sake of testing, I did install ATI fglrx 7.4 10.1 and, voila, I got flawless KWin desktop effects. Even proprietary stuff like Opera, Skype, and Flash plugin faced no serious problem as well. how's the resolution on the 15" screen. the 1366x768 resolution seems a little big for such a large screen. @Matt: The screen could have a better resolution, but I'm fine with 1366x768. FGLRX 7.04? Thats strange, because according to ATI's current name scheme this driver would be almost threee years old. @Burke: My bad, fixed now (was a wrong copy paste). Thanks for noticing! 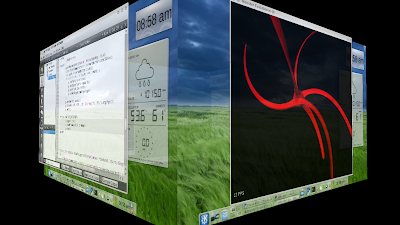 I don't think xf86-video-ati handles 3D for RadeonHD cards. Has this changed? Yes, that has changed. Cards up to HD4xxx have 3d support now. Does the 3D support in xf86-video-ati driver is pretty good for OpenGL-related development? I've been working with OpenDE and OpenGL in my freetime for a while with fglrx drivers. I'm keen to jump ship, but my system is a production system, I'd like to know whether you have a good impression about the 3D performance. The perfomance of openGL in xf86-video-ati is worse than that of fglrx. If you are using openGL in production, I'd not recommend it. For simple programs and compositing I would.